Born in Winston-Salem, North Carolina, A. Matthew's is an entrepreneur, world traveler, thrill seeker, art lover, champion racecar driver, treasure hunter and collector. Matthews spent his early childhood playing with the black children at the tobacco warehouses, while his father sorted and sold tobacco. Matthews fondly recalls the black workers relaxing with their music and drink at the end of their long work week. The essence of that wonderful spirit has been captured in his sculptures. 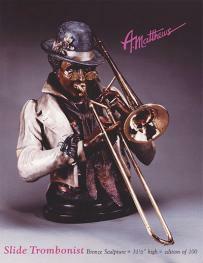 Matthews recently released "Hot Horn", based on Dizzy Gillespie, and is working on sculptures of other renowned musicians. In addition to the musical sculptures, Matthews has begun work on a suite of functional sculptures, beginning with "Back In Time", a bellman, to be followed by "Coffee, Tea or Me?" (A French maid), "What's Your Pleasure?" (A car hop), and "Ernest the Butler". Matthews received instruction in sculpting and assistance with the design of his minstrel series by his mentor, renowned artist and retired art instructor D.A. Russo, former protégé of Pablo Picasso, who gave Matthews some of Picasso's sculpting tools. He was awarded a bronze medal in Art of California magazine's 1992 Discovery awards competition for his sculptures. Having gained international recognition, Matthews has exhibited his work at Gallery '93 in London, England and Paris, France. His work has been exhibited at ARTEXPO, Los Angeles, New York, and Chicago as well as Sculpture in the Park and Loveland Sculpture Invitational, Loveland, Colorado.